Tasting Notes: An elevated food service olive oil, Molino La Condesa has a fruity taste because the harvest of the olives was done right at the optimum ripeness point. This EVOO is well balanced with aromas of apple, and a slight bitterness of radicchio and pepper on the palate. Recommendations: Molino is a great solution for a cost effective utility extra virgin olive oil in the kitchen. Use it for finishing all sorts of vegetables, salads, grilled meats and fish. This oil is also suitable for sautéing, frying, and poaching. 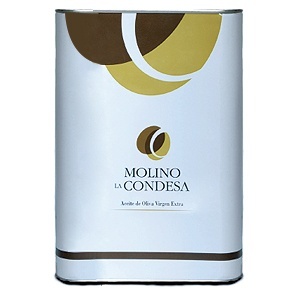 Molino la Condesa EVOO is produced by the same family as O-Med EVOO. Production begins in the beginning of November immediately after the O-Med production is finished. Juande, the millmaster finds the perfect blend of picual, arbequina, and hojiblanca olives. Molino la Condesa is meant to perform for a wide variety of applications which is less specialized than the O-Med mono-varietals. Molino offers an extremely attractive price point while still being early harvest with spectacular organoleptic qualities.